Today’s spread is the simplest and most straightforward so far. 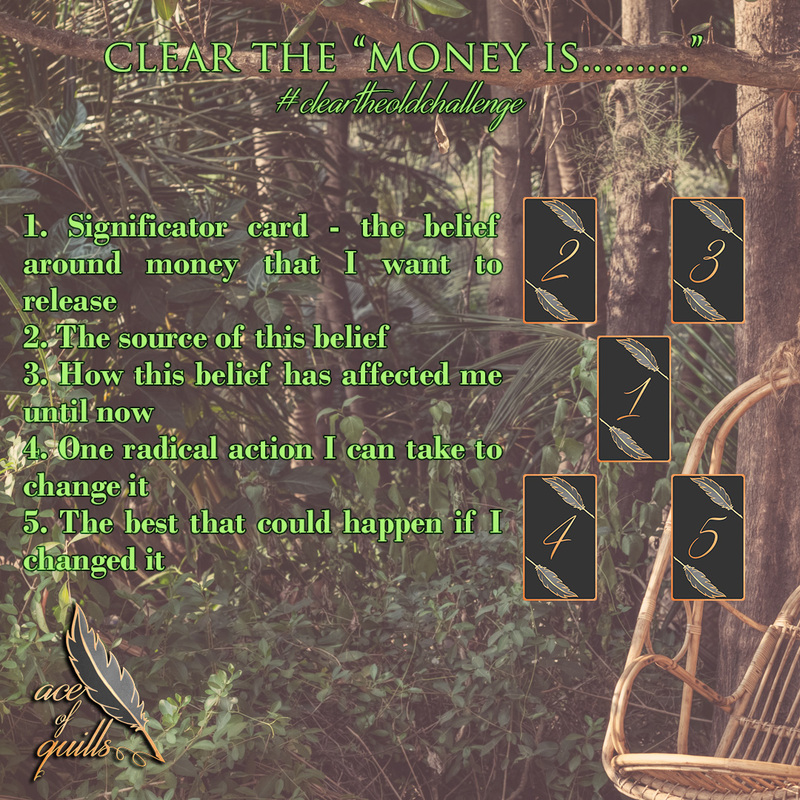 Here’s how it works: go back to the spread you did on Day 17, look at the first cards that came up to show you three things you learned about money in childhood, and choose the card you want to work with today. This card represents the belief that you feel affects you the most and needs to be released. Place your card in the middle of the spread, in position one – significator. Then, draw the next four cards after shuffling your deck. For example, my card is the Devil. In the Clear the Scarcity Program Spread, it came up to show me that one thing I learned about money is that it keeps you trapped in a job you hate. It’s not something that my family, relatives, and friends said to me directly, but something that I noticed through the years. As an adult, I did my best to avoid getting trapped in any kind of job and chose to be as independent as possible. It might sound strange, but I was never employed. Ever. I avoided it like the plague. I was always my own boss, and that came with other challenges, for sure. However, I still feel like the Devil in this position is affecting me, so I will use today’s spread to shed some light in this direction. Very curious to see what comes up! I strongly believe that in order to be able to see money as the flowing energy that it is, we need to identify the old programs that are running in the background. Because of what we learned and observed as children, switching from a scarcity mindset to an abundance mindset is not easy. It implies a complete change of perspective, probably something that the Death card of the Hanged Man card would impose, and this change will most likely trigger resistance. The Ego doesn’t like change, but that doesn’t mean we can’t gently convince it to release its hold on its old beliefs, so it can see things from a couple of different angles.